Hey! Going to be starting something a little new here on MorbidMuch -- random little articles about projects and things I'm working and little mail calls of things I've received and what I think is worth sharing. I'll call this new feature "MM Updates" (creative, right?). I'm working on new prints of the variant Scream VHS covers (see article image above for an idea). Not sure when they'll be ready, but when they are, you'll know. I'm finally displaying my Freddy Krueger figure. It's solid rubber, about 8" tall and was made in 1989 (see pic at bottom of post). I'm also currently working on a screenplay that could potentially reboot a well-known slasher franchise (here's a hint: it's not Scream). Today's the 18th anniversary of the Columbine High School shootings on April 20, 1999. This case affected me. I'm fascinated by it. I'm watching Bowling for Columbine now. 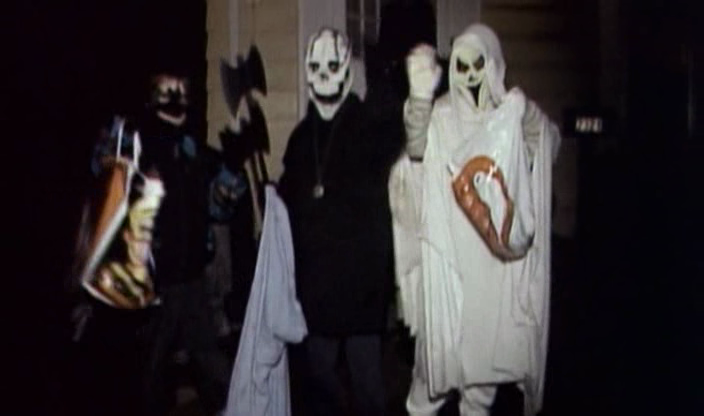 ...a shot from Bowling for Columbine showing an old Fun World ghost mask!